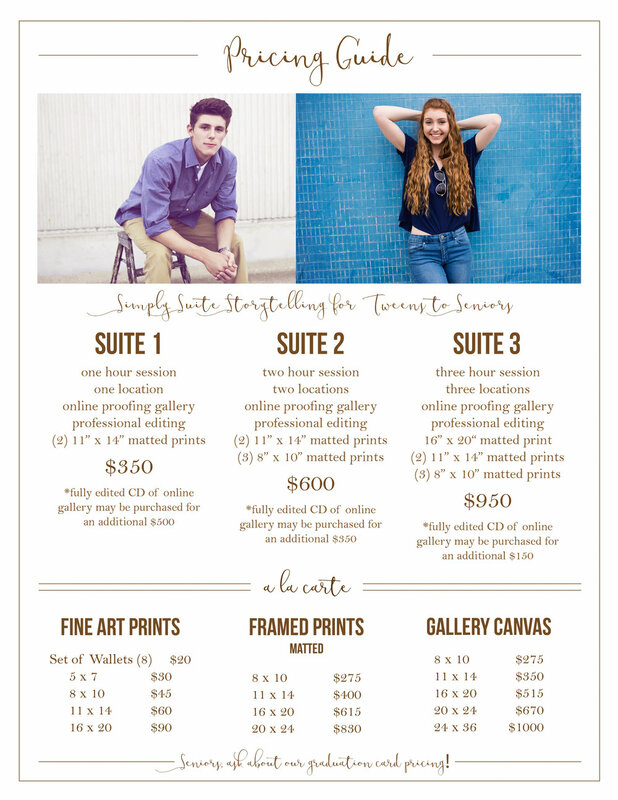 Below you will find pricing guides for our featured fine art portraiture. Our pricing guides include: Newborns, Simply Suite Storytelling for Tweens to Seniors, and Maternity, Family/Milestones, and Engagement. Our most popular products are listed in the a la carte section on each page. During your personalized preview experience, you will have the opportunity to see and hold examples of all of our products. Feel free to contact us with any questions you may have about specialized items not currently listed. Our Newborn session fee, which is due before we are able to book a session based on your due date, is $200. This fee covers pre-consultation, a 3hr. session, professional editing, and a preview gallery of approximately 25-35 images from your session. During your preview experience, you will be choosing between or combining a variety of five options to create a collection from your images. A la carte or digital images may be added to the collection. The remaining balance is due upon ordering. *Learn more about what to expect during our Newborn sessions in our planning guide below. Be sure to ask about our special Milestones pricing when booking 4mo., 8mo., and 1 year sessions. This is the perfect session to celebrate your Tween-aged child all the way through their Senior portraits. We have provided you with 3 suites to choose from that vary in time, location, and beautiful personalized prints to decorate your home with. 50% of the suite fee is due upon booking. During your preview experience, a la carte or digital images may be added to each suite. The remaining balance is due upon ordering. The session fee for Maternity, Family/Milestones or Engagement, which is due before we are able to book a session date, is $150. This fee covers pre-consultation, an hour to an hour and a half session, professional editing, and a preview gallery of approximately 20-30 images from your session. During your preview experience, you will be choosing between or combining a variety of five options to create a collection from your images. A la carte or digital images may be added to the collection. The remaining balance is due upon ordering. *Be sure to ask about our special pricing when booking your Maternity and Newborn sessions at the same time.